Equal Pay Day is upon us. Best con job ever! It’s that time of year. In ADDITION to 15 April (hated by the prosperous, loved by many others who get free money from the IRS) and “Earth Day” in all its glory, it’s time for our annual “boo-hoo-hoo” bemoaning how the helpless weaker gender works for far less then men. Yes, 10 April is “Equal Pay Day,” the mythical day that women must continue working in 2018 to make as much as men made in 2017. It’s one of the most persistent con jobs ever. It’s RIDDLED with incorrect facts, false assumptions, outdated data and — MOST IMPORTANT — omitted factors. Equal Pay Day is a WONDERFUL example of the liberal bias of MSM. It is indeed fake news. Mark my words. In the next few days the media will dutifully run headline stories — parroting the press releases from the gender pay pimps — while seldom if ever seeking a contrary analysis from knowledgeable economists. Even with all the bogus assumptions, the “helpless women” school of economics use the wrong “catch up” date. It’s not 10 April. It’s sometime in March, but they don’t want to change their chosen 10 April date simply because it is wrong based on more recent data. Facts DON’T matter (see the article below). Needless to say, this link no longer works since Trump took office. While there are instances of gender pay discrimination, they constitute a tiny factor in explaining the bemoaned difference in pay for men and women. The ONLY thing that is true in the assertion is that on average — men make more than women. Turns out, they make more for several good reasons — including (but not limited to) because ON AVERGE men work in the higher skilled , often more physically demanding vocations — and for longer hours. But there are other factors as well. Here’s the latest fact-filled blog by Economics Professor Mark Perry, highlighting two little-discussed factors. Men commute to work further than women on average — in just about ALL OECD countries. Men are more willing to travel further to a job — putting in more hours commuting than women. Detailing the VERY high percent of men in the high mortality, dangerous jobs. 94% of job deaths are men. Starting this week, there will be a lot of fanfare, hand-waving, hand-wringing, and calls for corrective legislation leading up to Equal Pay Day on April 10, which is supposed to represent how far into this year the typical woman has to continue working full-time to earn what her male counterpart/co-worker earned in 2017. That annual day is supposed to be determined by the most recent gender earnings gap comparing unadjusted median earnings for year-round full-time workers (BLS data here show an 18.1% gender earnings gap in median weekly earnings for 2016, the most recent year available). Actually, if you do the math, a gender earnings gap of 18.1% would mean that Equal Pay Day actually fell several weeks ago on March 20, a full three weeks before the day designated by the organization behind the annual event – the National Committee on Pay Equity (NCPE). Alternatively, using Census Bureau data for 2016, the slightly higher gender earnings gap of 19.5% for full-time, year-round workers would mean that Equal Pay occurred on March 27, two full weeks before the official day. And yet the NCPE declares authoritatively that “Tuesday, April 10, 2018, symbolizes how far into the year women must work to earn what men earned in the previous year.” Except that it really doesn’t, it’s a day that already occurred …. One implication of Equal Pay Day is that blatant, widespread and illegal gender discrimination in the labor market is one of the main reasons for the gender pay gap, which can only be corrected with increased regulatory action and equal pay legislation at the federal and state levels. But economists have pointed out for many years that there are many factors that explain gender differences in earnings including hours worked (“full-time” is defined as 35 hours per week or more, and men working full-time put in more hours per week on average than women), occupational and career choices, characteristics of occupations (risk of injury/death, family friendliness, flexibility in hours worked), and family and childcare choices among many factors. And here are two more factors that haven’t received much attention but might help explain some of the unadjusted gender earnings gap: a) the 16% “geographical gender gap” that reflects the gender difference in the average distance that male and female college graduates move from their university for their first jobs after graduation (an average of 318 miles for women vs. 370 for men, suggesting that young men on average consider a wider geographical area for post-college employment, possibly resulting in higher pay) and b) the 31% “gender commute time gap” in the US that reflects the longer daily commute time on average for men (25.3 minutes) vs. women (17.4 minutes), see table above for 26 Organization for Economic Co-operation and Development (OECD) countries including the US. 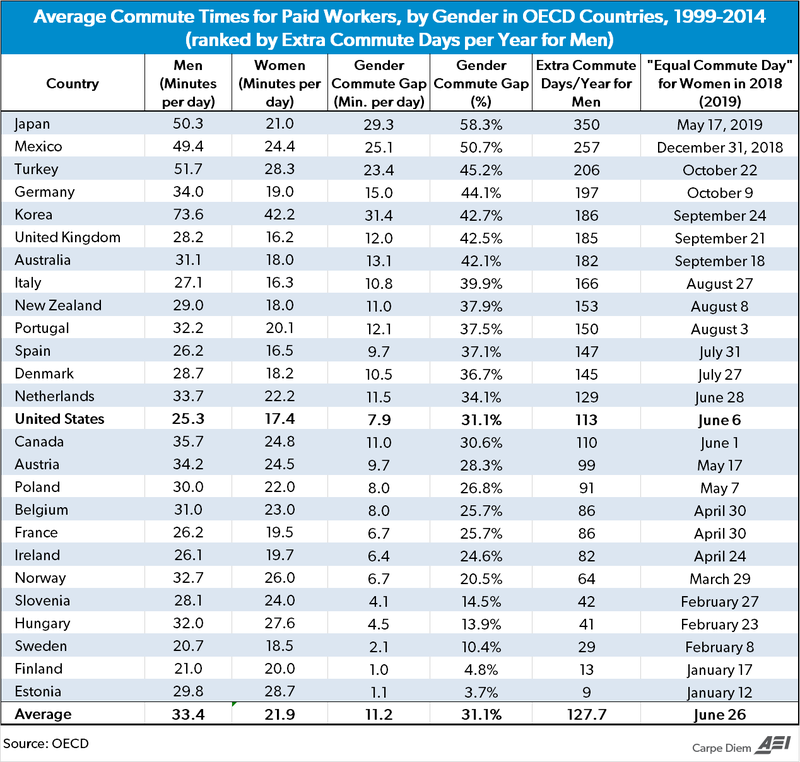 The average daily commute times by gender are from the OECD Family Database (available here, see Excel file for “LMF2.6 Time spent traveling to and from work”) and a summary of those data are displayed in the table above for 26 OECD countries. For all 26 OECD countries in the table above, men spend more time on average commuting to and from work each day, and the “gender commute time gap” ranges from as little as one extra minute of commuting time each day for men in Estonia to as high as 29.3 additional minutes each day for men in Japan. On average, men in the OECD countries spend 11.1 minutes more per day commuting to and from work than women, which works out to 46.25 hours more commute time annually for men than women, based on 250 work days per year. Expressed as a percent, there is an average “gender commute time gap” of 31.1% in favor of OECD women, who commute 68.9 minutes to work on average for every 100 minutes men spend commuting. Bottom Line: Behind the drive by gender activists and progressives for closing the “gender pay gap” – presumably to zero – is often the mistaken assumption that men and women are, or should be, completely interchangeable in their labor market and family roles. Those assumptions defy innate biological differences and the forces of Mother Nature. It’s an empirically supported fact that men have a much greater tolerance for (and attraction to) risk than women in many areas of life. 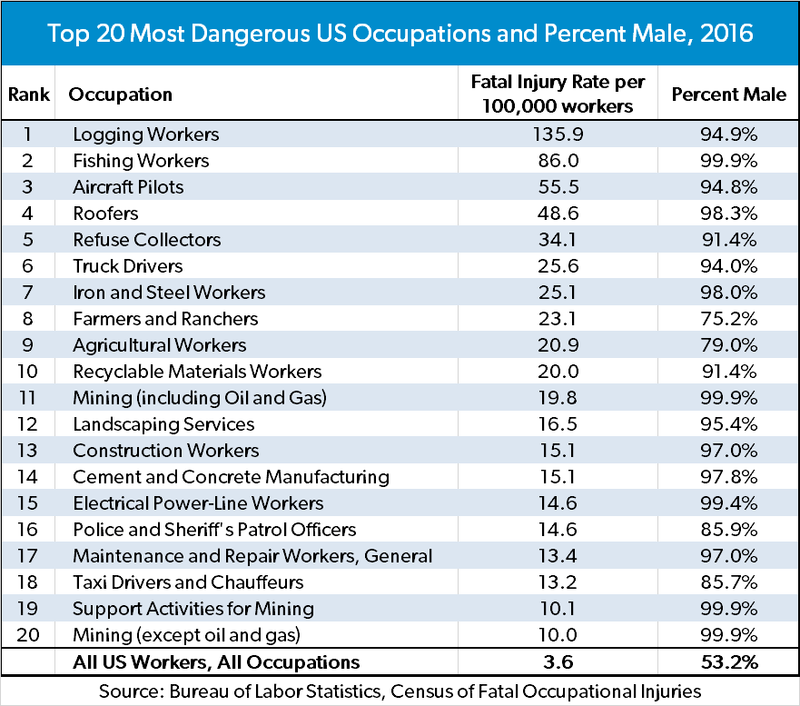 For example, 91% of motorcycle deaths in 2016 were male, 92.5% of workplace fatalities in 2016 were men (and see table below of the male overrepresentation in the 20 most dangerous jobs), 93.2% of the current federal prison population is male, and more than 90% of climbers attempting to climb Mount Everest between 1990 and 2005 were men. That higher male tolerance for risk helps explain some of the gender differences in pay – dangerous, higher risk jobs that are more physically demanding in harsh outdoor work conditions pay more on average than safer, lower risk jobs that are less physically demanding and are in pleasant, air-conditioned indoor offices. It’s also a biological reality that men can’t get pregnant and can’t breastfeed, which means that men and women will always play different family roles in childbirth and breastfeeding, and other nurturing childcare responsibilities. We learn about other gender differences for workplace preferences and for family roles from the OECD “gender commute time gaps.” In all 26 OECD countries in the table above men are disproportionately more tolerant of longer commute times than women, who on average prefer to work closer to home at job locations with a shorter commute. To the extent that longer commute times are associated with a greater selection of higher-paying jobs, longer average commute times for men would be another factor that would explain some of the aggregate, unadjusted gender differences in pay favoring men. Further, while having children has no effect on men’s average commute times (and in fact increases their commute times slightly), having children, especially when they are “under school age,” does affect women’s preferences for shorter commute times compared to when they are childless (see Table LMF2.6.A at the link above). This might suggest that women want more flexibility and shorter commute times after they have children so that they can more effectively and efficiently provide family and child care services. In conclusion, the OECD data suggest that women on average place a premium on shorter commute times to work, and therefore may be willing to voluntarily accept fewer job options and lower pay for being able to work closer to home, especially after they have children. This entry was posted on Wednesday, April 4th, 2018 at 6:09 pm and is filed under Blog Posts.